With the right know-how, a smaller bathroom can be just as stylish as something larger. Whether it’s a teeny tiny en-suite, a loft conversion with a sloped ceiling or a downstairs cloakroom, a small bathroom can be made stylish and sleek with a few tricks. Maximising space by making use of natural light, keeping bright patterns and colours to a minimum, and clearing up your clutter can totally transform a smaller bathroom. But that’s not all. By using the right fixtures to maximise your space, you will have freedom to style the bathroom how you wish. A shower is, of course, a bathroom necessity. Yet so many people think that just because their room is smaller , there are limited options when it comes to choosing the right shower and having a smaller space to work with definitely doesn’t limit your options. Here is a breakdown of the best showers for small bathrooms to help you maximise your space without compromising on style. Small shower enclosures slot into smaller bathrooms perfectly, and being small certainly doesn’t make them any less stylish. Small enclosures do what they say on the tin, they cater to smaller spaces. There are a few different types however, so it’s worth putting some time into figuring out how much space you have available to ensure you choose the right small shower enclosure for your bathroom. Corner enclosure are the perfect space saver, fitting snugly into virtually any size bathroom. There’s a variety of corner enclosures out there, in a number of different shapes and sizes, but if you’re really looking to maximise bathroom space a square enclosure is your best bet. Quadrant shower enclosures give a wonderfully modern feel, without taking up too much space. With clean curves and often a surprising amount of internal space, quadrant enclosures can feel slightly roomier than rectangular or square counterparts. Quad shower enclosures also work best positioned in corners, meaning they too are an ideal shower for small bathrooms. 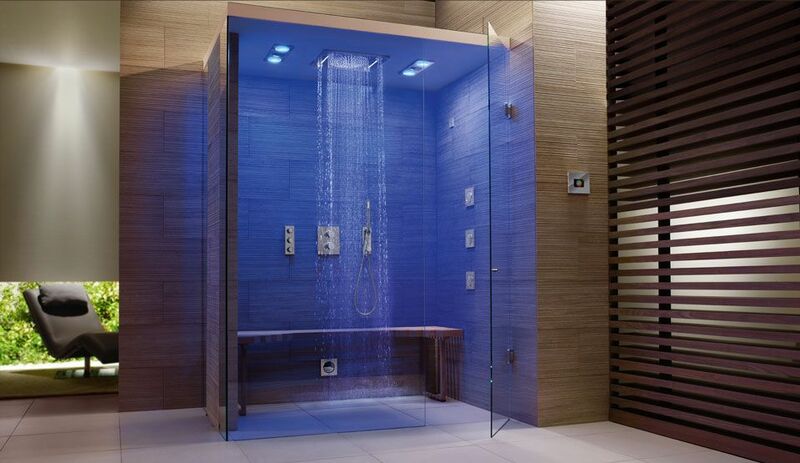 When shopping for a shower for a small bathroom, you may not initially think of a walk-in shower. However, we’re keen to show you that the right walk-in shower can look great in a small space. Firstly, walk-in shower enclosures are usually frameless which make the room look bigger, as the shower appears simply an extension of the room. 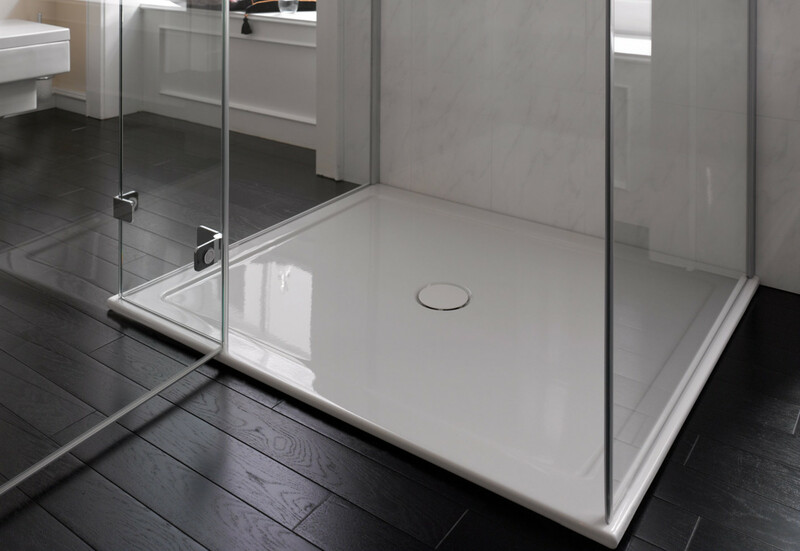 Plus, virtually any size of shower glass can be combined with a simple wet room tray to create a stylish and modern walk-in shower, as small or as large as you like! Walk in showers for small bathrooms are becoming more and more popular, thanks to their stunning look and sophisticated feel. Plus, they are generally very easy to create and mould to shape your smaller bathroom. Slimline shower trays are another way to ensure your shower takes up as little as possible, and can be combined with a beautiful glass panel to create the perfect minimalist walk-in shower. The thinnest tray currently in the market is 25mm, while shopping for a low profile shower tray it’s important to be mindful of the quality as the tray will see a lot of footfall and therefore needs to be durable. Buying a complete shower kit is a great way to save not only on time, but also money. For smaller bathrooms, it’s a good idea to invest in a slightly more luxurious shower kit, to make up for the lack of space. We have a wide range of kits available from our suppliers which work great for smaller bathrooms, helping you to enjoy your shower no matter how big your bathroom. Slide rails are usually the cheapest option when it comes to shower kits, and work great in smaller showers. They can be purchased in a wide range of designs to match your bathroom décor, whatever that’s vintage or modern. A square shower rail kit is the ideal choice for a more minimalist bathroom, it has a paddle handset, stylish chrome finish and a flexible shower hose, the height of it is easy to adjust making it perfect for both taller and shorter people, whilst also ensuring easy cleaning. If you want a more traditional bathroom, a shower slide rail kit is the shower kit for you. It’s suitable for both low and high water pressure, meaning there’s no compromise on luxury and looks great in vintage styled bathrooms. They can also include a wall outlet elbow, alongside the rail, shower hose and shower handset which makes it all in all a top contender for a smaller, traditional bathroom shower. 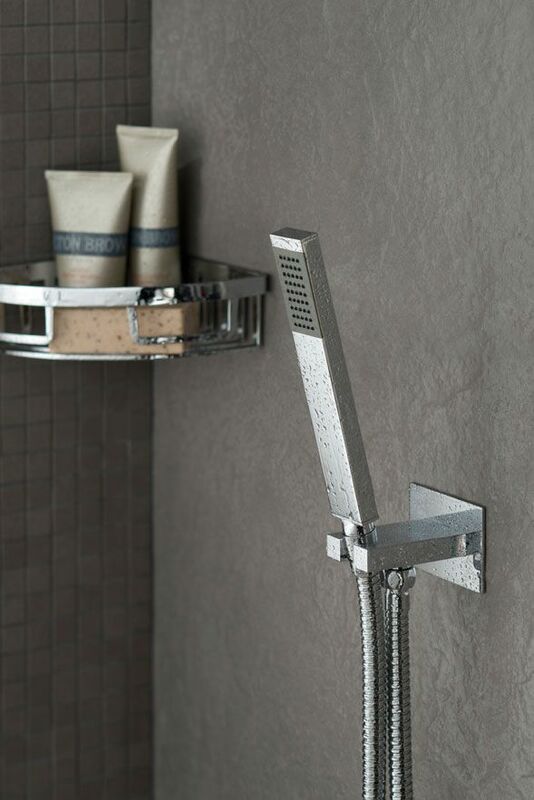 A fixed shower head and concealed valve also works well in a space-saving shower. They take up limited space, and provide that waterfall feel we all know and love. 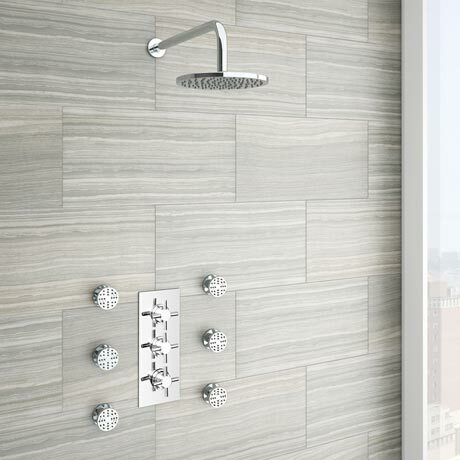 Non-intrusive and slotting perfectly into any smaller shower, with the square designs being more modern and stylish. Those of you who have really limited space may want to consider a mini shower kit. While these make a great addition to any normal shower, if you’re really in need of space saving you might opt for a stand alone shower handset. A square shower handset is one option, with it’s unique design and smart chrome finish helping to keep your shower and bathroom as minimalist as possible. If you don’t fancy something square then a round option is just as stylish, they come in sleek, modern design and polished chrome finishing and great to save space in a very small bathroom shower. You may feel like your options are limited when it comes to small showers for a small bathroom, but hopefully this post has assured you that there is a huge range of options available. While clean and minimalistic is the most popular shower choice for smaller bathrooms, it is certainly not your only option. Optimising your space using a variety of fixtures specifically designed for smaller spaces means you have the freedom to be a little more creative, while still keeping that luxurious bathroom feel. Call us today to speak to our friendly installations experts 01727730590 or use our contact form. ← How to improve your central Heating System ready for the winter.